Marine Travelift said it delivered a new 820 C mobile boat hoist to J. Goodison Co.
Marine Travelift said the 820-metric-ton-capacity machine is now the largest boat hoist in the Northeast. Marine Travelift said it delivered a new 820 C mobile boat hoist to J. Goodison Co. at its new Quonset Point facility in Rhode Island. The company said the delivery of the 820-metric-ton-capacity machine makes it the largest boat hoist in the Northeast. Goodison’s establishment of a new brick-and-mortar location with the boat hoist marks the beginning of a new era for the business, which had been a traveling-based service company in previous years. 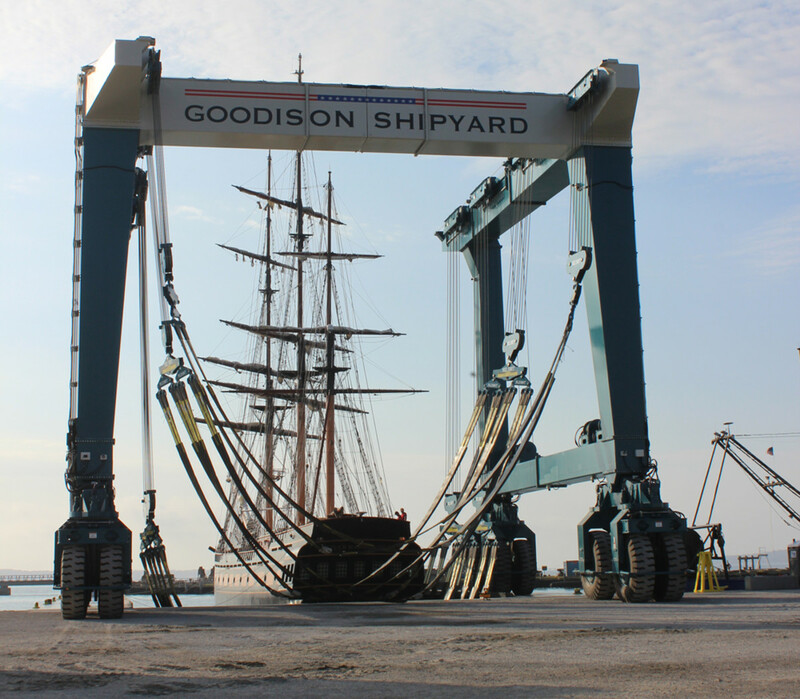 Jack Goodison, an owner/partner of J. Goodison, said the company’s new shipyard location has been seeing immediate results since the hoist was delivered. Goodison said it is establishing its position in the shipyard business as a location with unique capabilities that allow for the hoisting of vessels with a width of more than 56 feet and a height of 60 feet. “We knew acquiring this boat hoist would open up a niche, and it did. We’re getting the larger, more difficult jobs that would like to be taken to a shipyard, but had to schedule and wait for service in dry docks previously,” Goodison said. To work with such large vessels in tight quarters, the 820 C was equipped with Marine Travelift’s patented all-wheel electronic steering option. “The all-wheel electronic steering has really made a difference,” Goodison said.